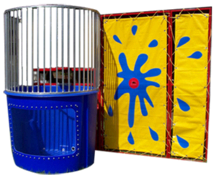 Looking for a Dunk Tank Rental in Davenport Bettendorf, Rock Island, Moline, East Moline or the surrounding areas? We have you covered. Our 500 gallon Dunk Tanks will bring a wet challenge to your event that will be sure to generate excitment and revenue. The Dunk Tank is loads of fun with a new challenge everytime a new person takes the seat. Players test their arm accuracy as they pitch balls at the round target, once the player hits the target with enough speed and accuracy the target triggers the seat release and the "sitting duck" plunges into the water below! Our Dunk Tanks all contain the see through window so you will be able to see the best part of the dunk when the person "sitting duck" is plunged into the water.